To finish up this series on how to put Beef in the Freezer, there is one last final step, and that is selecting how you want your meat cut and packaged. 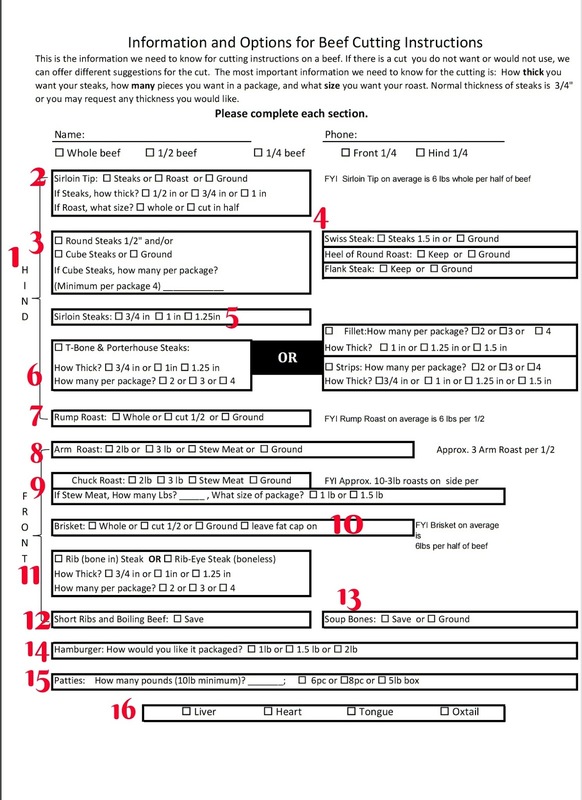 Barb Beutler, of Beutler Meats, graciously let me share their Beef Cutting Instructions document below to help explain this sometimes tricky business of choosing what cuts will best work for your family. Hang on, We will take this slowly. 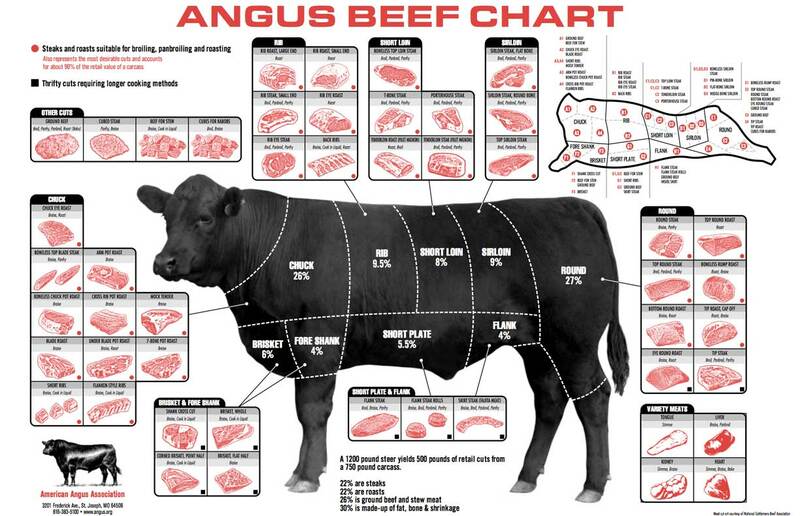 Thanks to Blue Ridge Meats for this chart! 1. 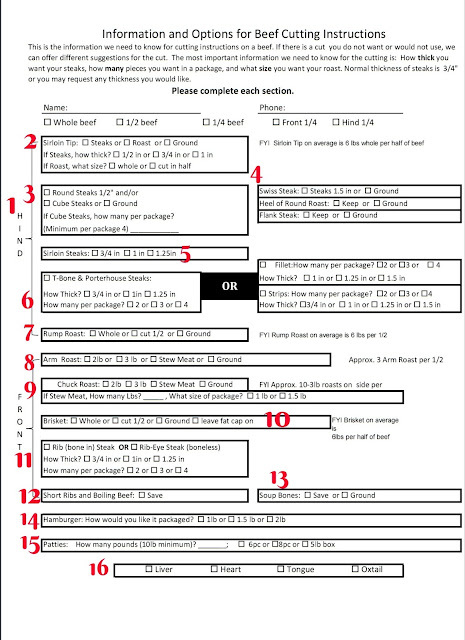 I have to tell you that Beutler's Meats changed up their order form from the last time I looked at it. The newest option reads down the left side of the page, and it divides the cow into front and back. I bet you are wondering, "Why would you want to buy the front or back half/quarter of a cow?" I know I was, so I called Miss Barb, and I asked her that very question. Here's her answer in a nutshell: The front half will give you most of the steaks if that is what you really want. The back end of the cow gives you more roasts and hamburger. There you go! I learned some new information as well. The only catch is that if you want mostly steaks, you need to find a friend looking for more hamburger because that back quarter/half needs to go somewhere. 2. Sirloin Tip: As a steak, this cut of meat works like a flank steak. Sirloin Tip Steaks are great with marinades and cooked on the grill. Use the meat for fajitas, steak salads, or steak roll-ups. As a roast, this cut serves up a very lean roast and is great cooked rare to med rare then sliced for roast beef sandwiches. If you just want more hamburger, this cut can be added to the pile to be ground. 3. Round Steaks: We love to make fajita wraps, and I use quite a bit of round steak to make up the meat part of the wrap. Cut the round steak thinly, add some sliced onions and peppers, and you have the makings of a yummy fajita wrap or salad. Round steak can be a bit tough, so keep the slices thin and DO NOT OVERCOOK! We are all partial to rare/med rare here (except for hamburger). Cubed Steak: This cut is round steak tenderized, which means it is pounded or run through a machine that puts indentations in the meat and stretches it to a thinner slice, kind of like a pork tenderloin before you fry it. Speaking of frying, if you love country fried steak and gravy, this is your cut of meat. I also cut this up for fajita meat. 4. Swiss Steak: Swiss steak is much like cubed steak only it is a thicker cut. You might fry this up and serve with egg noodles, or you can make Beef Stroganoff with it. If that is not your favorite meal, then I would add it to the hamburger pile. Heel of Round Roast: This roast is one of the least tender roasts, but it makes a great pot roast or you can cut it up into stew meat. As in most of the roasts, it can also be put into the hamburger pile to add its leanness to your hamburger. Flank Steak: I like this steak because, like the Sirloin Tip, it is awesome marinated and cooked on the grill. 5. Sirloin Steak: This might be known as a "Poor Man's Steak," but cut thick and grilled correctly, it can be just as mouthwateringly delicious as its pricier members of the steak family. I would go with the 1 or 1.25 inch thickness. 7. Rump Roast: This is the roast you think of on Grandma's Sunday dinner table with mashed potatoes, gravy, and veggies being passed around the table. You should probably be polite, and split this roast in half unless you and your meat partner figure out some other arrangement. It can also go into the hamburger pile if no one is overly fond of roasts. 9. Chuck Roast: If you are splitting a half of beef, you will have about 5 roasts to play with in your "What's for Supper?" family game. Slow-cooked, this meat can be perfect in beef and noodles dishes. You could also go with stew meat for stews AND soups. Have some fun with this cut, or add it to the growing hamburger pile. 10. Brisket: I know there are some BBQ peeps out there just waiting for me to get to this premier cut of meat. If you are not familiar with the possibilities of a brisket, Google it, and prepare to smoke it to perfection. Keep the "fat cap" on the cut, and trim it yourself to preference. I would never put it on the hamburger pile. 11. Rib (bone in) Steak or Rib-Eye Steak: Ah! Here we are at the heart of my family's favorite cut of beef, Rib-Eye Steak! We go boneless, but if you are a gourmet chef/cook and want to serve an impressive dinner, you can keep the bones in the meat. Here also is a great example of how the Red Rule of Meat can make you pause and consider. These steaks are delicious, and I think the thicker they are, the better they are. This means we don't have many packages of them in our freezer. You can go the other way, and go with 3/4 inch thickness. You would have more steaks, and they will make the world's best rib-eye steak sandwiches. Ok, now I'm getting hungry! 12. Short Ribs and Boiling Beef: When you think of ribs, I know you are picturing meat dripping with sauce and you are probably making those sounds you make when you are in food heaven, BUT those ribs are pork ribs 97% of the time. Beef ribs are not as meaty, but some love them just the same. I use them plus the boiling beef to make be small beef bites that go best with noodles. It's a bit of messy work to get the cooked meat off the rib bones, but it's worth the effort! 13. Soup Bones: These are just what they say they are. Like Group 12, this cut brings both meat and flavor to your soups. Cook down in a large pot or crock pot, remove the meat from the bones, keep the broth, add veggies or whatever makes your heart happy, and you have beef soup! 14. Hamburger: Alrighty, it's time to do something with the pile of meat we set aside for hamburger. I've never had to worry about "fatty" hamburger when using the meat from our cows, but you can talk to your processor about leanness of your ground beef, and get your desired percentage. The dilemma here is in the packaging. Most recipes call for a standard one pound of hamburger, so there's a vote for one pound bags. If you are serving more than four people, or like to have extra hamburgers to pack in the next day's lunch, you might want to go with 2 pound bags. To throw a wrench in all of the figurings, we get ours packaged in 1.5 pound bags because I think 1/4 hamburgers are skimpy, and when making lasagna or cheeseburger pie, we like the extra meat in these dishes. 15. Hamburger Patties: I believe this is an extra const on your ordering process, but many a family swear they wouldn't go without premade patties sitting in their freezers. In a pinch, it is so convenient to have hamburger patties ready to go on the grill, even if they are frozen. Extra guest show up? You get home late from a game? No worries when you can run to the fridge and grab some patties to plop on the grill. Liver: Well, you either love it or hate it or have never tried it. We get our liver and deliver it to those in the family who like it. I'm in the third category, but there are too many other delicious meat cuts that I love. Heart: Apparently the beef heart can be grilled, fried, and used as a substitute for a hamburger, but I haven't had it any of those ways. If you hate to waste meat, you can throw it in the hamburger pile, or you can make your dog happy, and cut it up to use as a treat. Tongue: This is Tall Guy's other favorite piece of beef, and believe it or not, I have tried this cut and actually liked it! The girls even liked it until I told them what they were eating. Pressure cook the tongue, peel off any parts that make it look like a tongue (taste buds), and the slice it for sandwich meat. It can also be eaten like a piece of roast. It's seriously good if you are a master of mind over matter. Whew! That was a lot of information, but I wanted to be thorough so if you go into to a processor to discuss your cutting options, you will go fully armed with knowledge. In the next post, we will wrap all this information up in a recipe bow!